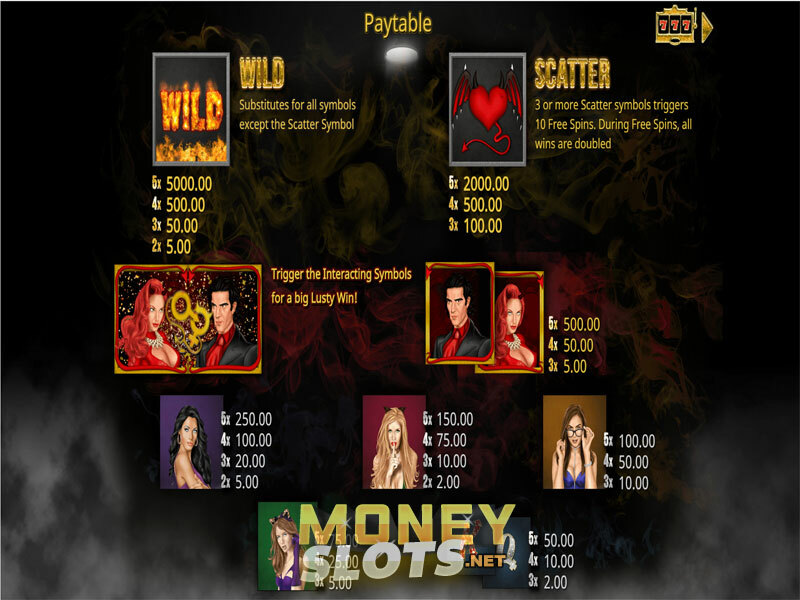 Devil’s Heat is a fiery video slot released in June of 2017 by the Malta based software provider Booming Games. The title focuses on the lustful temptations the Devil sets forward for all men, and those who are not charmed by the hot babes will be able to admire the decent visuals and fun gameplay, driven by the bonuses and low volatility the title has. Animations for some icons could use a bit of polishing, however, and the soundtrack is too short, very audibly looping after two-three minutes. The RTP for this game is 95.08%, which is average – not bad, but certainly not great, either. That said, the title has Interacting symbols that award wins when they are next to each other, as well as a free spins bonus with a x2 multiplier. The 5x3 playing field looks alright, but it does not have any extra decorations that we have seen in other releases by Booming Games. The background image is equally disappointing, showing a black void and some smoke beneath the reels. Symbols include K and Q, four beautiful women with different stylings, all doing their best to seduce you, a red-headed devil woman and a man in a sharp, black suit. While all the icons look good, the brunette with cat ears and purple gloves looks a bit weird, as does the man in the suit. Special symbols include the word Wild set on fire as the Wild symbol, a heart symbol with wings and a succubus tail as the Scatter, and the devil woman and man in a suit, who are Interacting icons. All wins are rewarded by getting three or more identical icons to appear consecutively following one of the aforementioned ten paylines. Devil’s Heat has ten fixed paylines. This means gamblers can only change the line bet to adjust their total bet. Said total bet can range between $0.10 up to $200 per spin, which is an awesome betting spread. Using the Autoplay function, you can play up to 100 spins with the press of a single button. However, if you need to leave early or do not want to play any more, you can choose to end the auto spins early. While Interacting symbols can bring you some decent wins, they fall more in line of consolation prizes, in our eyes, as chasing after the free spins is far more lucrative. Collecting three or more Scatters rewards ten free spins, during which, all wins are doubled. It is possible to retrigger the bonus by collecting three or more Scatters again, which rewards ten more free spins. There is no limit on how many times the free spins can be retriggered, which means, theoretically, you could keep retriggering it forever! Devil’s Heat is available to players on desktop, mobile phones and tablets alike. While, sadly, it is not the best we have seen the developer do, it certainly provides for interesting gameplay under the right circumstances. That said, it clearly needed a bit more polishing before it was released.